In addition to providing identification and information, interior signs communicate a lot about your business. In many ways, interior signs are just as important to your business and its image as outdoor signs. Attractive, high impact interior signs inspire customer trust and confidence! 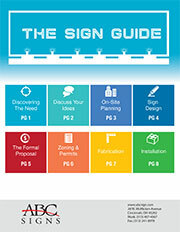 ABC Signs develops many styles of indoor signs to suit a wide range of needs. We will bring your design to life, or assist you with creating artwork for interior signs for every purpose. From concept to construction to installation, ABC Signs will take care of all phases of creating all of your interior signs.